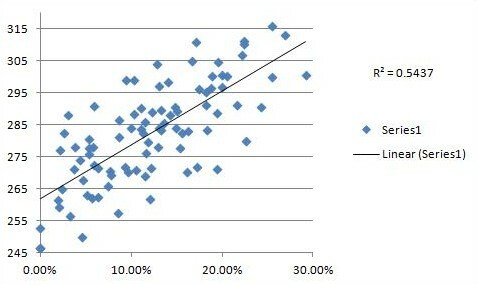 Recently I’ve taken a look at early season changes in contact rate and fly ball rate because of Russell Carleton’s research showing we’ve reached the point in the season where the sample for those statistics has become ‘reliable.’ There has been some debate in the comments about what reliable means and how much the small season sample can help us in predicting what a player will do the rest of the season. I look at it like this. For the statistics that have crossed that reliability threshold, we can look at the players who have seen the biggest changes in either direction and feel safe that their skill has improved or decreased to some degree. That doesn’t mean regression isn’t coming. It just means that at the end of the year it wouldn’t be a surprise to see a player with an improvement or decline from their career mark in a particular category. Although the improvement or decline at the end of the year is not likely to be as extreme as it is at this point in the season. Today I want to look at the hitters who have seen the biggest changes in ISO because a fair number of players have now crossed the 160 AB threshhold shown in Carleton’s research. Below are the guys who have seen the biggest increase in ISO. After that, we’ll examine whether some other statistics back up the power surge. And a little bit later we’ll see if we can’t figure out how much regression to expect. The first thing that jumps out at you when you look at this list of names is the overall youth. 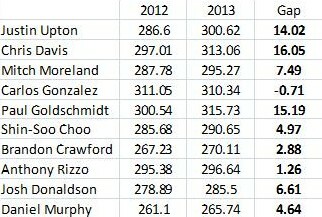 Of the ten, eight are 27 or younger, and Daniel Murphy and Shin-Soo Choo are the oldest at only 28 and 30, respectively. Choo has the switch from Cleveland to Cincinnati going for him as Cincy is about 6% more homer friendly for lefties than Cleveland is. I also took a look at whether these guys had seen an increase in average HR and fly ball distance over at baseballheatmaps.com. Below are the results. This largely backs up the increases in ISO with all but one in the sample seeing an increase. It’s especially encouraging for Justin Upton and Chris Davis given that they have seen the biggest ISO increases. Carlos Gonzalez’s ISO increase seems bit fluky according to this data. However, his average line drive and ground ball distance is up about 24 feet. And home runs aren’t the only component of ISO. Doubles and triples count as well. Cargo is hitting doubles once every 16.67 PAs this year compared to once every 18.67 PAs last year. The next question is how much regression should we expect? With the help of Jeff Zimmerman’s baseballheatmaps.com, Mike Podhorzer and Chad Young did a five part series on predicting HR/FB rate here on the site. You should absolutely check it out. It’s phenomenal work. And I’m assuming most of you have seen it. They found that there is a strong correlation between the average distance of batted balls and HR/FB. They then took the study much further and I honestly don’t have the ability to use their formulas. For my simple purposes of trying to identify over and undervalued fantasy players, I’m just going to use average HR and fly ball distance to compute some sort of expected HR/FB rate. Below is a graph showing the relationship between the two for the hitters with 160+ PA this year. Denard span had the lowest average HR and fly ball distance at 246.53 feet. Paul Goldschmidt is tops at 315.73 feet. That’s a range of 69.2 feet. The slope of that trendline is 0.003238 meaning for every extra foot within that range the HR/FB% increases by .003238. So if we multiply the slope and the distance each hitter is above that 246.53 foot minimum, we can get an expected HR/FB (xHR/FB%). Again, I realize this is a more than imperfect way of doing this. But I’m just trying to get a general idea of who has the most regression coming, and this is a decent enough way to serve that purpose. 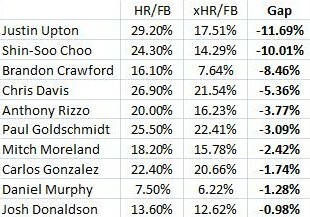 Both Upton and Choo have a gap between their HR/FB and my version of xHR/FB that is more than two standard deviations away from the mean. Maybe you should consider dealing them for hitters who are more capable of sustaining higher HR/FB rates. Of the two, I’d be more inclined to deal Upton for two reasons. 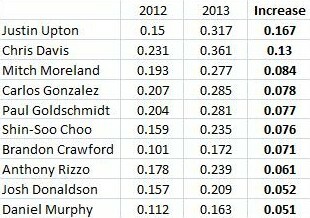 First, the gap between the perceived value of Upton and Choo is much larger than the actual gap between the two. You can get more for Upton. Second, Choo is more of a multi-category contributor. Upton’s average is just that, average, and he has only attempted three steals so far (all successful). Meanwhile, Choo is a solid four category contributor. Davis, Goldschmidt and Gonzalez seem like possible targets. Goldy and Cargo are five-category contributors. If power is your biggest need, Davis is an attractive option. And if you dealt Upton for Davis or Goldschmidt, there’s a possibility you could add an extra piece on each side in which you would have the advantage to make up for the loss in draft day value. Maybe that’s a reach, but it’s worth a shot. As for the other guys, this little exercise has sold me on Mitch Moreland and Josh Donaldson having some staying power. I wouldn’t be looking to sell them. We all suspected Anthony Rizzo was for real. Brandon Crawford’s power is sure to regress, but who is buying him? And Murphy is fine to hold on to if you’re using him at middle infield. Long story short? I would not have a problem trading Upton. We hoped you liked reading Muscling Up: ISO Surgers by Brett Talley! I’ve actually been talking about dealing Upton for Goldy in my league. We count OBP and SLG. as well as the standard R, HR, SB, RBI and AVG. Would you take Goldy straight up in that deal if you couldn’t get more? It’s a permanent keeper league as well. No penalty for keepers longterm. Who gets the edge in that format? Thanks. I think I prefer Goldy there as well.